Filipina expat Rose Herrera has worked in Qatari and expat households in Doha for 24 years. She is about to leave her existing sponsor, who is moving back to their home country. Here, she explains the trials facing some domestic workers looking for fair employment, and calls on employers to treat her colleagues with respect and dignity. I am a housemaid and nanny, working here in Qatar for more than two decades. I’m currently working with a family who I’ve been with for more than five years. I have been lucky to have them because they treated me nicely, as a member of their family. But now they are leaving Qatar for good and the time will come for me to move on. I’m gonna miss them. I have had good conditions with them, not like other housemaids and nannies that I sometimes meet. Many maids work long hours – more than 10 hours a day. Some of them have no day off a week – even on a Friday, they are still working. And it’s physically hard work. Usually I clean the bathrooms, tidy up around the house, dust and mop all the floors, vacuum, iron if I have time. Then I have lunch and a rest before the children come home from school. Some days I am very tired, especially if I’ve had a very busy day. I know other maids who have curfews, so they can’t go out for an evening during the weekend. And they have a small salary – some of them get QR1,500 or QR1,600 a month. One recent report said this is the average now for a maid in Qatar. But in my experience, it is not enough to live on, especially as many maids need to buy their own toiletries and phone cards. I came to Qatar after my father died, and I supported my two sisters through high school and college, as well as my mother. At first, I sent almost all my money home every month and had nothing left to spend on myself. People ask me why I’ve stayed here so long, but I have lots of family in the Philippines to look after. I send home about QR1,200 each month normally. That goes to food and electricity for my 12 year-old daughter and my mother, a small allowance to buy my daughter things she needs for school, medicine for my mom and of course school fees. I want my daughter to go to college and get a good job. I also support my 17-year-old niece, as her mother doesn’t have a job and her father is not around. If it’s a special occasion, like birthdays, I’ll send more home for cakes and small presents. For Christmas, all my salary goes home so my daughter and mother can each have a new dress. Before I got married, I saved enough money to build a house, where my daughter and mother now live. It still needs the kitchen to be finished and painted throughout, so I’m trying to save some money for that too. Many housemaids in Qatar are in a similar position to me – some have more children, three or four. They have to pay all those school fees and budget for their food. And many of them are single moms, so they are the only ones earning money for their family. I think the minimum a maid should earn here is QR2,000. That would give them money to buy what they need, and still a little to send home to their families. The reason we are here is to make some money for our children and parents in our home countries. We sacrifice our lives for them so they can get a good education, get a degree and have a better paying job. Wages in the Philippines are very low. If I had stayed there, I don’t know if I could have sent my daughter to high school. Some nannies aren’t very lucky. I know maids who have been harassed and mistreated by their employers, or given little food. Some employers don’t even give their housemaid or nanny a day off, or if they do, it’s a limited time and as soon as they reach their home, they still have work to do. I know of at least one maid who was locked inside the house when the family went away for the summer vacation. Other maids are not allowed to leave their compound without their sponsor, or even talk to other maids inside the compound. And some sponsors don’t give us Qatar holidays off, like Eid Al Adha, Eid Al Fitr, National Day or Sport Day. Having a day off and away from the house is a big help for homesickness. I have family here, but others are very lonely. Getting together with friends – going to church, having lunch, going to the Corniche or the park – it is the best medicine because you have someone to speak to and for a few hours, forget about work and the problems of the week, and just talk and laugh together. Some housemaids have worked in Qatar for five or 10 years, but when their sponsor leaves for good, they aren’t given any benefits like end of service. Others still have their passports held by their employer, which is illegal. And some don’t have a (Hamad) health card, so they are obliged to pay for their own. 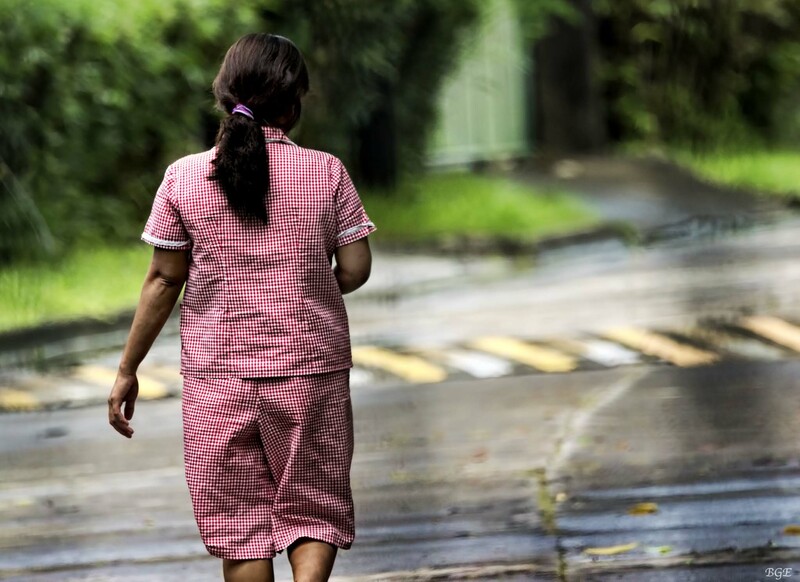 I saw the new law for maids (Domestic Workers Law, No. 15 of 2017, signed by the Emir last month) and I was happy to see holiday leave, flights home and other rights for housemaids and nannies. We hope that we can all avail of these mandatory rules by the Emir to help us live a decent life in Qatar.